Please find details for our rare Mercedes Benz C200, Spec as follows: Brilliant Blue Metallic---Black Full Leather Interior---AMG Bodystyling---19" Multi-Spoke AMG Wheels---Premium Package---Panoramic Glass Sunroof---Keyless Entry/Start---Electric Memory Seats---Powered Bootlid - Up & Down---Reverse Camera---Navigation - Sat Nav---Bi Xenon Headlamps---LED Daytime Lights---High Beam Assistant---Heated Front Seats---Bluetooth Phone Prep---Bluetooth Audio Stream---Electric Folding Mirrors---Parking Sensors - Front & Rear---Active Park Assist---DAB Digital Radio---Multi Function S/Wheel---Cruise Control---Privacy Glass---Auto Headlight Activation---Auto Wiper Activation---Air Conditioning---Climate Control. 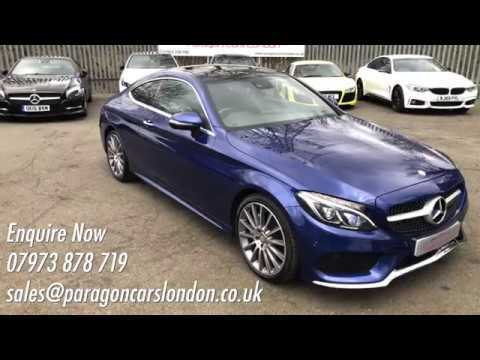 This Mercedes C200 AMG Line Coupe looks stunning in this sports colour combo and comes with great extras such as Panoramic Sunroof, 19" Wheels, Memory Seats, Reverse Camera and more! The car benefits from a Full Mercedes Service History.